The objective of this funding program is to support NSW visual arts practitioners in their mid to later parts of their careers to challenge and expand their practice. 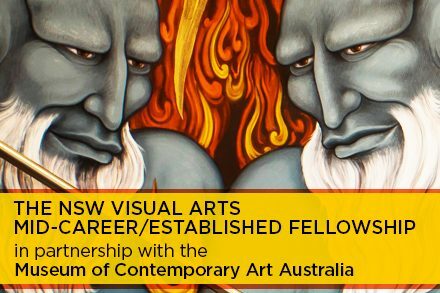 One Fellowship will be awarded to a mid-career or established visual artist to undertake a self-directed professional development program or a significant opportunity to support their personal creative and career advancement. The value of the Fellowship from Create NSW is a $30,000 Fellowship, with an additional project or acquisition commission from the Museum of Contemporary Art Australia (MCA) up to the value of $20,000. In addition to the Fellowship from Create NSW, the artist will work with the MCA to develop a project with the MCA appropriate to their practice. This may involve the commissioning of a new work (including in the areas of performance, online and other ephemeral practices) either for the MCA Collection, for presentation in the MCA building or externally, or as part of MCA learning and public programs; or a residency or other form of MCA-related program activity. The outline of this project – including timeline for its realisation ¬– will be developed between the artist and MCA staff after the awarding of the Fellowship, and be subject to a separate agreement between the artist and the MCA. Funding is available for Fellowship programs starting after 1 January 2019. The professional development program (as separate from the project with the MCA) must start within six months of receiving the Fellowship and completed within two years. This Fellowship targets a specific career stage, you will be asked to explain how you self-define as a mid-career or established visual artist. Applications open on Wednesday 1 August 2018 and close on Wednesday 12 September. Before you apply, please read the Grants for Individuals Guidelines (short version) or the full version of the Arts and Cultural Development Program Guidelines for more comprehensive information, including special eligibility requirements, assessment criteria and support material for this funding category. The information on this page is a guide only. Please note this Fellowship does not involve an exhibition component as has previously been required.